The main body is riendeer antler, with buffalo horn inserts. It’s a great little knife – hope I did it justice. This entry was posted in Bushcraft Clothing & Equipment, Customer Posts on January 4, 2011 by Woodlore Team. Very impressed with your finished article, because I myself love doing similar work. I have always wanted to put reindeer antlers but don’t know where to get hold of them. Would be great for any info where I can obtain them. You’ve done an excellent job on the handle, truly stunning. 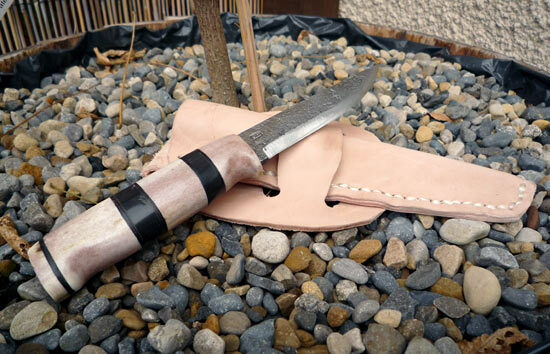 Just one small point you might want to consider is to add a steel tip protector to the sheath. If you were to fall, a good quality sharp knife can pierce right through the end of the sheath and seriously injure. Fixing a steel tip on the end of the sheath protects against this. you definitely did it justice mate.